Featuring "A Sign Of The Times"
Artist Jerry Pagane in front of some of his paintings inspired by American Sign Language. If I were to name one common trait common to tough guys it would be a hard childhood. Broken homes, juvenile detention centers, orphanages, group homes, foster homes, physical and / or sexual abuse… . I have known a number of tough guys. Jerry Pagane is one of the toughest guys I know. What makes him different from the rest of the tough guys? Two things: his size and his disability. The things I admire most about Jerry are his art, his spirit, his work ethic, his struggle to become an artist and his lifelong dedication to his vision and his art. Recently Jerry came to me because he has a new body of work and he must show this work. The focus and theme of his current exhibition is examples of hand signs: drawings and paintings of hands, using fingers to form letters, words, ideas and so on. This exhibition is happening for two reasons. The first is to highlight Jerry Pagane’s original artwork. The second is his need to acknowledge, support, honor and bring public attention to the fact that September is Deaf Heritage Month and that this year, 2017, is the 200-year anniversary celebration of the standardization of American Sign Language (ASL). The exhibit is composed of 13 drawings with color washes and four paintings with acrylic on canvas. I have supported and admired Jerry’s artwork for decades. Beyond his artistic talent, his craftsmanship and control of his tools, I am drawn to his content — his form of social realism, how he incorporates typical neighborhood life into his work. Over time, the community social-realist art works like a neighborhood quality-of-life timeline — early ’80s burned-out buildings, fires raging and firefighters fighting them and saving lives, homeless on street, drugs, cops, then on to pleasant restaurants and to today hipster’s suntanning in Tompkins Square Park. This exhibition is a little different; Jerry needed to stand up and be known as a deaf artist. I felt Jerry’s pain, his anxiety and his need to show this work. 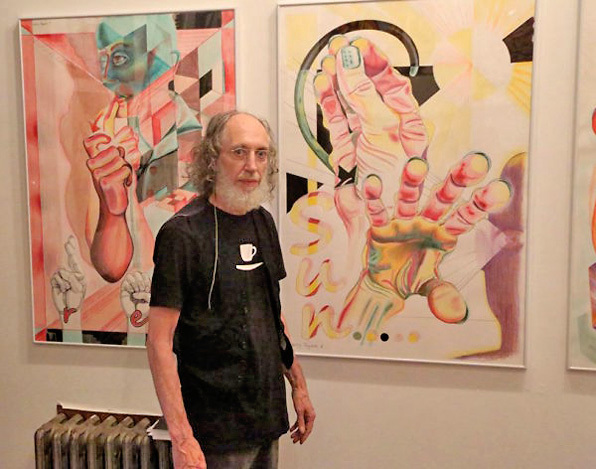 The hand-sign artworks are beautiful, well executed, educational, inspiring to be around, and they remind one that Jerry is a deaf artist and that deaf people can become recognized respected artists. Jerry Pagane was born Christmas Eve, Dec. 24, 1948. Today, as he has been since I met him, Jerry is small and thin, appears a little delicate, but is wiry and very strong. I suspect he was a tiny baby. He was born deaf and without ears. Christmas Eve he was left on a church doorstep. He was passed around from social agencies to five foster homes and two orphanages. The foster homes and orphanages were ethnically and racially diverse. Life was hard. Being deaf has disadvantages, and then to be small and without ears, one cannot even imagine. In junior high school, he gets the chance to become a part of an upper-middle-class family. The mother and father, churchgoing people, wanted to bring a troubled child into their home. The family already had four boys and one girl. The father was a fundraiser, and the stay-at-home mother had been a recipient of a national civil service award. The other siblings grew up to become a doctor, an engineer, a computer specialist, a medical-service specialist. And then there was Jerry. Jerry started off as a difficult child. It got to the point where the father sternly warned Jerry to change and become a part of the family, or he would go back to the foster home. It was at that moment Jerry found love. He changed. He took art classes under the youth art programs at Carnegie Mellon University. He got into the Boy Scouts and eventually earned the rank of Eagle Scout. As an Eagle Scout, he was awarded the rare Arrow Award, which is special because it is your peers who choose the recipient. In 1973, Jerry was the first deaf person to graduate from Carnegie Mellon University. A painting of Jerry hangs in C.M.U. He went on to teach art, and then 1983 moved to E. Seventh St. between Avenues C and D.
In an e-mail, Bill, one of Jerry’s brothers, recalled how Jerry suddenly became part of their family, but how it took awhile for everyone to adjust. "Jerry came to live with us in Pittsburgh and became our foster brother when I was a young teenager and Jerry was a few years older, in the 1960s," he said. "Jerry looked and spoke different from us, and at the beginning, he rarely smiled. I was a little afraid of him because he was more tough, and more willing to fight, than anybody I knew. Jerry brought with him issues of hearing, speech and language that I never knew could be problems. It was hard to earn Jerry’s trust at first. But little by little, as he got used to our family’s routines, and we got used to Jerry’s personality and the deaf culture he was part of, things got better." Jerry Pagane: "A Sign Of The Times," at Clayton Gallery and Outlaw Art Museum, 161 Essex St. (between E. Houston and Stanton Sts. ), through Sept. 10; closed Sept. 1-4. The works can be viewed by appointment by contacting Clayton Patterson at 646-612-0624 or clayton@claytonpattersonles.com .